Roman Catholicism And The Idol! This week’s sermonet – “Roman Catholicism And The Idol” – is a bit of a surprise to say the least. I mean I was very much so involved in finishing up what I thought would be our next message – “Marijuana: The Weed God” – when the Lord kind-a like sprung this one on me. Now if you would like to listen to “Dave and Tom’s” complete message, the program was entitled Does Prophecy Validate the Bible and it originally aired on 1/1/06. You can find it on the Web, under The Berean Call’s radio program archives, at “http://www.thebereancall.org/radio”. Now did you catch that? According to Exodus chapter 20, “I am the Lord thy God” was not God’s first commandment but only the introduction to it. “Thou shalt have no other Gods before me” was actually the first, and “Thou shalt not make unto thee any graven image” the second. 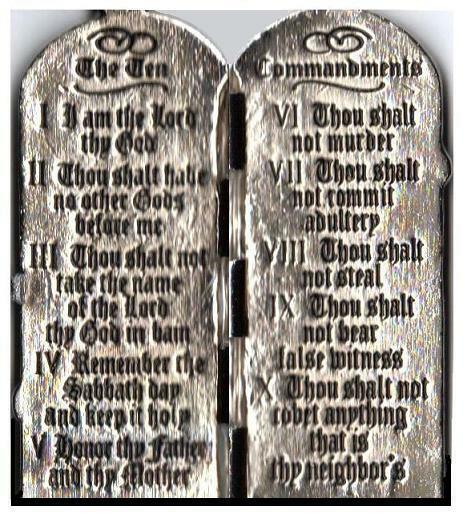 However, from that point on TBN’s listing of the Ten Commandments was right on target: “Thou shalt not take the name of the Lord thy God in vain”, “Remember the Sabbath day and keep it holy” and so on. 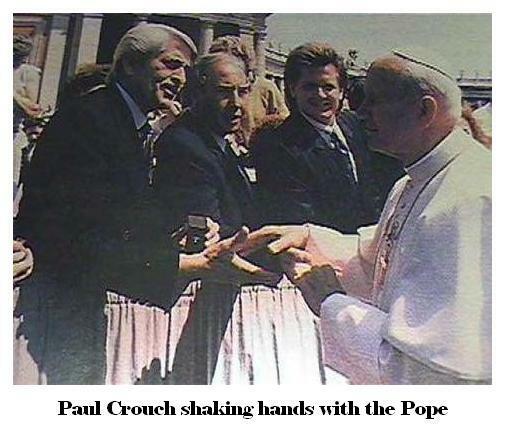 But the question remains: “Why in the round world would Paul and Jan Crouch (TBN) tamper with God’s Ten Commandments?” I mean why do you think they were so willing to defy God, and likewise suffer His impending wrath, in order to remove His #2 commandment concerning “the worship of idols”? Well the answer to that question is what this sermonet is all about…and what this sermonet is all about is “The Idol” that the Roman Catholic Church will demand the whole wide world to worship in the very near future! Amen? In fact if you really want the low-down on TBN’s ungodly involvement with the Roman Catholic Church, and the worship of their idols, then check out Jack Chick’s book Smokescreens. You can read it on the Web at “http://www.chick.com/reading/books/153/153cont.asp”, and make sure to check out the Show Biz chapter for the “wicked skinny” on Paul and Jan Crouch. “You shall love the Lord, your God, with all your heart, with all your soul, and with all your mind…You shall love your neighbor as yourself” (Matthew 22:37, 39) [2055, 2083]. These are an extension of the two great commandments. The first three tell you how to love your God; the rest show you how to love your neighbor . 1. You shall honor no other god but me [2084-2141]. 2. You shall not misuse the name of the Lord your God [2142-2167]. 3. Remember to keep holy the Sabbath [2168-2195]. 4. Honor your father and your mother [2197-2257]. 5. You shall not kill [2258-2330]. 6. You shall not commit adultery [2331-2400]. 7. You shall not steal [2401-2463]. 8. You shall not bear false witness against your neighbor [2464-2513]. 9. You shall not covet your neighbor’s wife [2514-2533]. 10. You shall not covet your neighbor’s goods [2534-2557]. Are you still with me? So why do you figure the Roman Catholic Church has gone to such great lengths to get rid of that one little old Commandment: “Thou shalt not make unto thee any graven image”? So now do you understand the underlying reason for the Roman Catholic Church to promote their “idol worship”? The Roman Catholic Church is the “First Church of the Antichrist”. Their White Pope (Benedict the 16th) is the “second beast” of Revelation 13 (also known as the “false prophet”) who will demand “world wide” worship of “The Idol” made in the image of the Black Pope (Jesuit General Kolvenbach) who is the “first beast” (Antichrist). And it’s only through many years of preparation, that, in the very near future and at the appropriate time, millions of “Christians” will bow their knees before “The Idol” of the Antichrist and doom their souls to the everlasting fires of Hell. What a bust! In fact the reality of what’s taking place with this “worship of idols in Christ’s Church” has been demonstrated many times before with a frog. You see the way to cook a live frog in water, without even getting him all upset and aroused, is to gradually elevate the temperature of the water. By turning up the heat real slow his body will become so accustomed to the water’s temperature that he’s cooked before he knows it. Amazing! And you see that’s the way it is with most Christians of today: they are the frogs in Christ Church who’ve jumped into the pot of the Apostate Church (TBN and the likes). They’re really getting cooked with all the false teachings on “idol worship”! But anyway, check out the sermonets “The Roman Catholic Curse In The Passion Of The Christ! (4/25/04)” and “The Demons Of Cristo Rey And El Paso, Texas! (1/25/04)” on the Web site for more on the subject of the Roman Catholic Church and their idols…and keep on keeping the faith in Jesus! Gee! 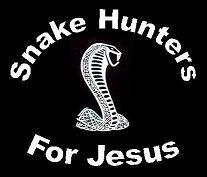 I wonder why the Roman Catholic Church would leave out that one? I mean, can you even imagine?